We took the kids to see the Minneapolis skyline this evening. We enjoy walking parks and I thought going to one in the city would be a fun and different experience. We found a really pretty park, there were many different sounds and different scenery yet, still in a nice wooded trail area. The park gets its name from the island that it once was. The island was named for the booms that were used to separate logs floated down the Mississippi River to sawmills powered by St. Anthony Falls. Each log cut along the tributaries of the Mississippi River was “branded.” Each lumber company put is own stamp on the end of its logs and they were separated using those stamps and directed to the proper saw mill by men working from Boom Island. The sawmills at the falls were eventually replaced by flour mills. On our way back from the cities we saw a very impressive fireworks display near Plymouth, Mn. 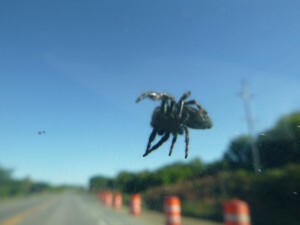 Even this little guy came along to enjoy the ride ~Whoa Nelly~ we hitchhiked this 8 legged beauty about 40 miles.